Home » Mattresses » Toppers » What’s the Best Memory Foam Topper for My Mattress? An uncomfortable mattress is often the difference between a good night’s sleep and a poor sleep. With mattresses being as expensive as they are, using a memory foam mattress topper can be a great idea. Read on to know all that you needed to know memory foam mattress toppers and about some of the best memory foam toppers. When NASA developed memory foam way back in 1966 to ensure their pilots have a happy backside after a hard day’s work, little did they know their invention will become so popular in coming decades. But that’s exactly what has happened, and not without good reasons. Memory foam does offer some unique advantages, none more important than its ability to conform to your body and distribute your body weight evenly. No other mattress material comes even close to matching it on these two things. Unlike in other materials where your body weight is born by only that part of the surface that is directly under you, in memory foam the weight is distributed evenly across adjacent areas. This ensures you feel less pressure under your body, and you, therefore, feel better supported and get better relief from pain. Memory foam takes the shape of your body when you lie on it, ensuring each part of the body is supported well and weight is distributed proportionally. This helps diffuse the tension stored in your sore or pain areas and you wake up fresh and rejuvenated in the morning. These are top things to look into when buying a mattress topper, so keep them in mind when you start creating your shopping list. Remember, these things aren't cheap, so it's important to get it right the first time! Each memory foam mattress topper carries a density rating, like 3 lb or 4 lb. This rating tells us the density of the mattress topper, that is, how much does a cubic meter of that memory foam weighs. If the rating is 3 lb, a cubic meter of that foam weighs 3 pounds. Memory foam of higher density last longer. Memory foam with 5 lb rating is likely to outlast memory foam with 3 lb rating by as much as 10 years. ILD is a measure of memory foam firmness and is calculated by measuring the amount of pressure (in pounds) is needed to indent a 4-inch thick piece by 25%. ILD is denoted as a two digit number, usually in a range 10-16. Generally speaking, the higher the ILD, the better the mattress. If you are a stickler for quality, you might want to buy only Certipur-US certified foam or memory foam that has passed similar standards for testing of foam for harmful toxins and chemicals. A Certipur-US certified memory foam means that the foam has been made without PBDE flame retardants, ozone depleters, harmful metals, formaldehyde, and unapproved phthalates. Memory foam is a popular choice for filling mattress and pillows, but like many other popular things, many misconceptions have become attached to it. Density per cubic foot and ILD are two important technical specifications of memory foam. They both give us an indication about quality of a memory foam mattress topper, but remember an indication is all they give—nothing more. Often memory foam mattress toppers of identical density and ILD have a different feel to it. Therefore, check out these technical specifications (they are important) but don’t get obsessed with them. The overall comfort of a mattress topper can only be told after feeling and experiencing it. There’s no other way. ILD is as good as quality marker as Density rating. While ILD does tell us about how soft or firm memory foam is, the fact is that it is not a regulated marker as far memory foam are concerned. Density rating, on the other hand, is a much safer bet. Also it is much easier to compare different mattress toppers on this parameter as most manufacturers use this rating as a quality marker. Where the foam is made doesn’t matter if it’s not certified. Carrying a reputed seal of approval means that the memory foam meets certain standards. However, if there is no such seal, can we even then differentiate two memory foam pieces on the basis of where they have been made? Most experts believe, yes, we can. Memory foam made in the US, Canada, or Europe is usually considered of better quality than made-in-China products. With 3 inches in thickness, the Thick Bed Topper is suitable for almost all types of old mattresses, even one that has a few sagging areas. You are not likely to feel any indentations or sagging areas of your old mattress if you lay over this topper. Thanks to its 4 pound density, the topper is firm enough to provide good support but not so firm that you feel uncomfortable lying on it. 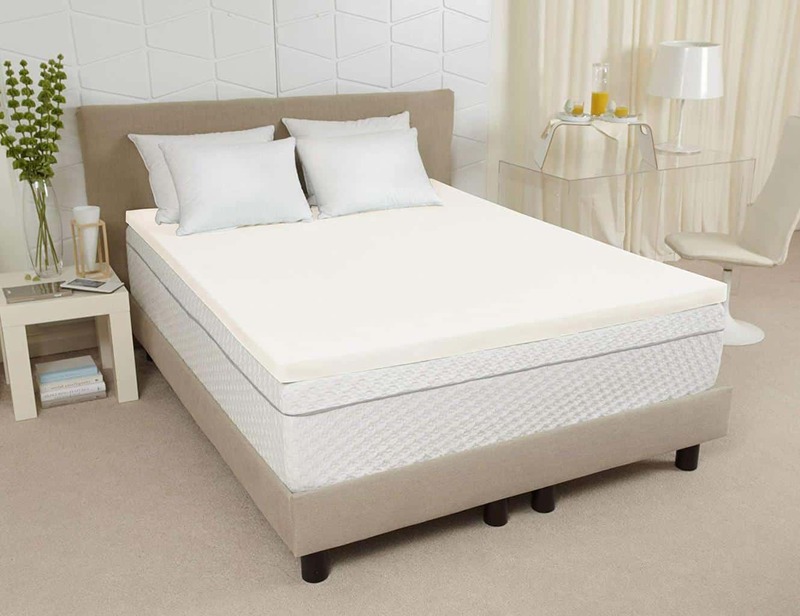 One very important feature of the Thick Bed Topper is that it doesn’t rely on heat to contour your body, like many other memory foam toppers. This basically means that the topper cradles your body the moment you lie on it, irrespective of how cool or warm your body is. The topper is suitable for both side and back sleepers and aptly supports various pressure points that can be causing all those aches and pains in your body. It is made in the USA. Those who prefer homemade products will have another reason to seriously consider this product. The Dual Layer Memory Foam and Polyester Topper (available in multiple sizes) from Sleep Innovations features a unique design featuring 2 different materials for maximum comfort. The mattress topper has a luxurious feel that conforms to the curves of your body to reduce pressure points and improve circulation. 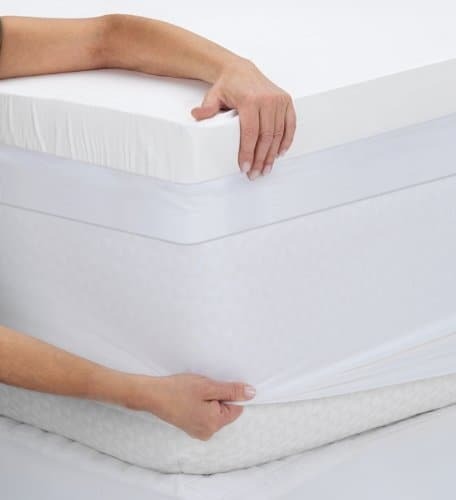 The topper features 2 layer deign that houses a plush 2" down alternative comfort layer and a 2" SureTemp memory foam layer to gain benefits from both materials. The fitted cover is made of 300-thread count high quality 100% cotton and holds the topper securely in place. And the topper includes a 10-year limited manufacturers warranty so you can sleep knowing you can return if necessary. Air it out for 72 hours before putting it top on your old mattress. The 3-inch Gel Memory Foam Mattress Topper is firm but not too firm. This is a good thing for those are using memory foam for the first time. With 3.2 pound density, the mattress topper provides sufficient support and you are not likely to feel any indentations of your mattress. The topper features a waterproof cover and it doesn’t trap heat like some other memory foam mattress. Of course, this doesn’t mean it feels cold; it just means you are not likely to feel hot sleeping on it. As the topper is made of memory foam, which is naturally dust mite resistant, it might be a good option for allergy sufferers. Another advantage of this mattress topper is that it comes with a 5-year limited warranty. You can expect some odor when you unwrap it. Airing the topper for 24 hours should be enough in diffusing the smell. This memory foam mattress topper comes with a 100% gel that ensures good comfort during sleep and enhanced therapeutic qualities. The topper provides uniform support and moulds accordingly to the body shape of the sleeper. Thanks to the gel beads technology used, this memory foam mattress topper has efficient air circulation. You are not likely to feel hot sleeping on it even in slightly warm conditions. Another advantage of Millard Gel Infused Topper is its removable bamboo cover. This topper is made from natural materials and is resistant to dust mites, allergens, bacterial, and molds. If you are asthmatic or allergic, you might find this mattress topper appropriate for you. 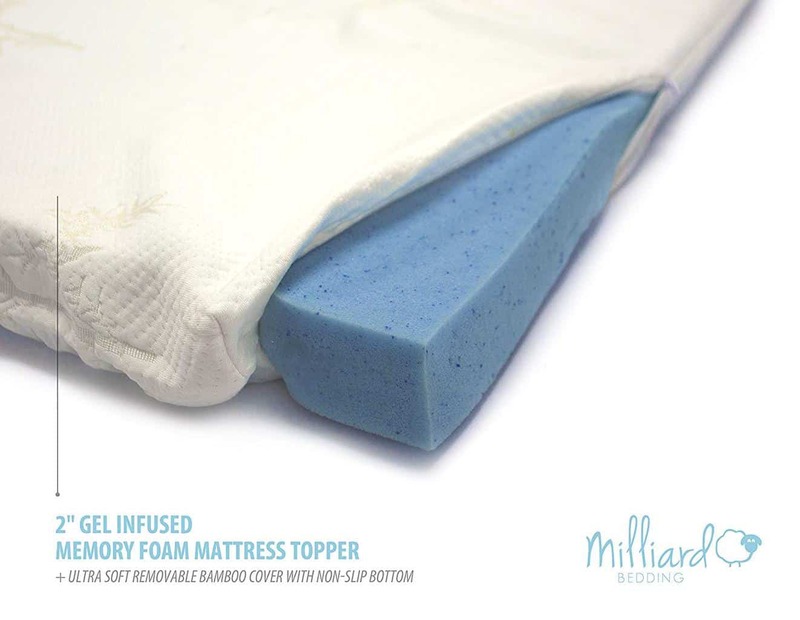 Milliard mattress topper does smell when new. Airing it for 24 hours should be enough to get rid of the odor. All in all, you might want to consider this memory foam mattress topper if you are not happy with your mattress, especially if you have back, neck, or shoulder pain. The ViscO2 Memory Foam Mattress Topper has a density of 4 pound per cubic meter. It is denser than most other mattress topper and provides better support. Pregnant women or people suffering with back pain are likely to find great relief on using the topper over their old mattress. Another advantage of this topper is that is extremely breathable, ensuring you don’t feel hot at all while sleeping. The ViscO2 Mattress Topper is odor-neutral, which is almost a rarity in memory foam niche. This is great news for those who are hypersensitive to slightest of smells. If you prefer products made in the USA over those made elsewhere, Sleep Joy might be just the very thing you wanted. The mattress topper, however, doesn’t come with a cover. If you don’t want to risk it getting stained, you will have to spend a few additional dollars to purchase a cover.